ePublishing Knowledge BaseePublishing Knowledge BaseePublishing Knowledge Base User Profiles and Registration FormsHow do I turn the right rail on or off on a user's profile? This template is accessed at https://www.yourdomain.com/user/profile. A user must be logged in to access this page. We've made the right rail that many sites use be optional on this page to allow the user to focus on the important work of reviewing their data and making any relevant updates, printing their invoice, or finding the link to the premium article they purchased a few months ago. 2. But you can turn the right rail off, as shown below. Zoom: But you can turn the right rail off, as shown below. 4. Scroll down until you see “user.profile.hide.sidebar” and click Edit. The following will open. 5.1. 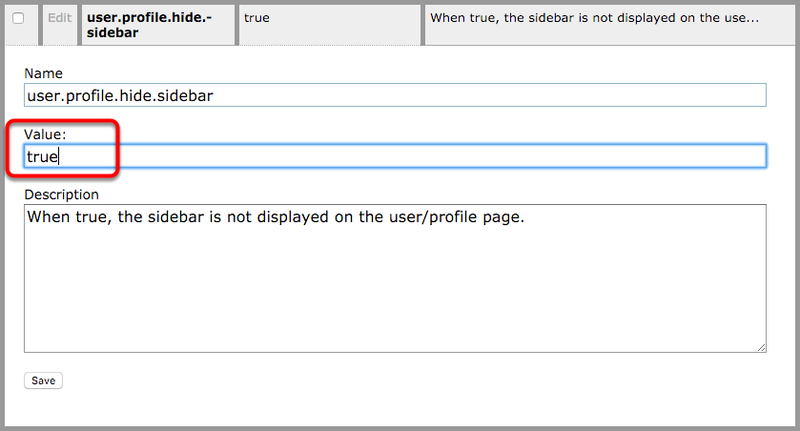 To turn the sidebar OFF, type “true” in the Value field. 5.2. 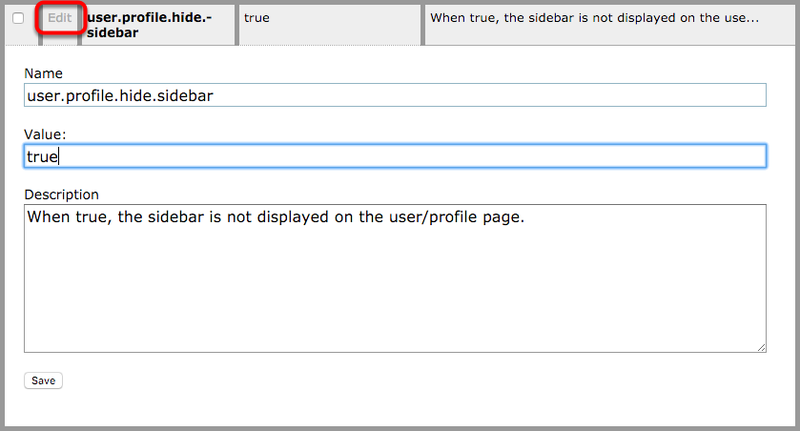 To turn the sidebar ON, type “false” in the Value field. 6. Click Save to apply your changes. View your changes on your website. Prev: How do I view usage data on articles, products, directory listings and other content? Next: How Are Product IDs Setup in the order receipt?